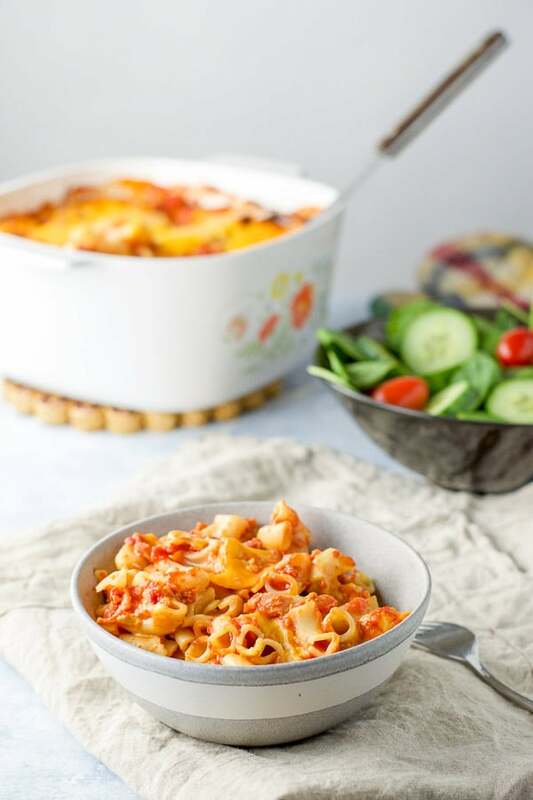 This is my grandmother Bena’s bacon tomato pasta casserole recipe. 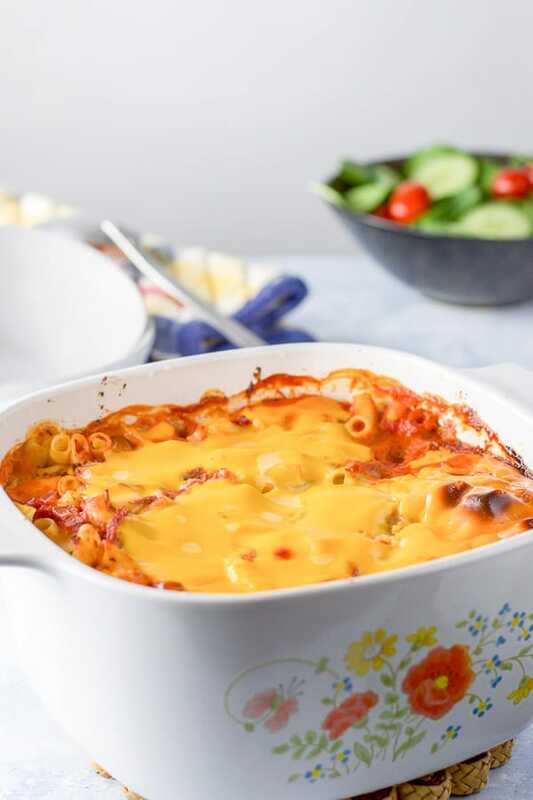 It is an indulgently gooey take on mac and cheese but add some bacon and tomato sauce and you get the best comfort meal ever. This recipe has been passed down the generations. My family members all make it and I’m sure future generations will make it, not even knowing who Bena was! It is one of those time-tested, soul-satisfying recipes that, once you’ve eaten it, you just have to make! Can I make this recipe healthier? Do I have to use Velveeta cheese? 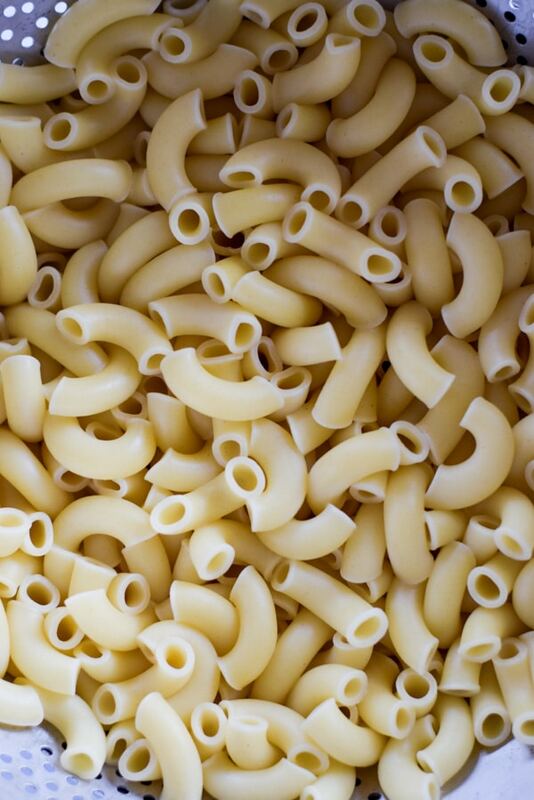 Do I have to use elbow macaroni? For myself, I don’t see a way to do it. But that’s what makes it comfort food. I feel that most comfort foods are not super healthy, which is partly why they are comforting. So, if you are looking for a comforting dish, this is the dish for you. No! My family does, but you could substitute with cheddar, muenster or others. It’s okay to experiment, peeps! Nope. Your favorite noodle should work just as well. I love casseroles! What about you? One of my all time favorites is the lobster casserole because I love seafood with a seacoast passion. Christopher grew up land locked, so he’s more partial to my rice casserole. Get a medium sized casserole dish. Fill a stockpot halfway with water and salt it with 1 tablespoon of salt. Turn the heat on medium high until it comes to a boil. Heat a sauté pan on medium/low heat and cook the bacon for 10 minutes, flipping it every few minutes. Remove to a paper towel lined plate and blot the grease. Chop bacon to smallish pieces. (C) Transfer bacon to the sweetened tomatoes and stir to combine. Add elbows to the boiling water and cook for 10 minutes. Transfer to a colander and rinse with cold water to stop the cooking process. Cover the casserole dish and bake for 30 minutes. Once the timer dings, take the cover off and continue to bake it for another 30 minutes. Look at all that cheese. I love the crispy bits. My sister does not. I hope you enjoy making this bacon tomato pasta recipe as much as we enjoy EATING it. What is your favorite casserole? Leave me a comment as I’d love to know. 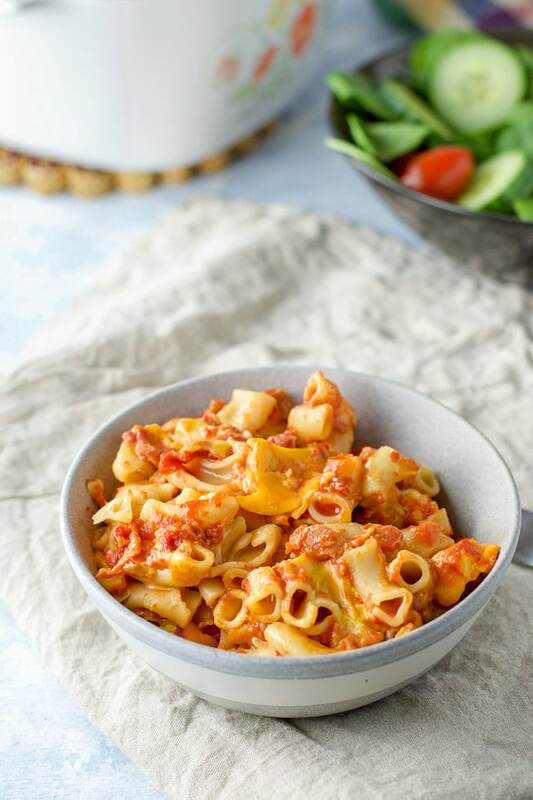 If you’ve tried this Bacon Tomato Pasta recipe, I’d love the know what you thought about it in the comments below. I love hearing from you! You can also FOLLOW ME on FACEBOOK, TWITTER, INSTAGRAM and PINTEREST to see more of my delicious food and delightful cocktails! The milk measurements are approximate. You want to pour in enough to reach halfway up the casserole dish. I love finding family favorites like this! Yum! Yum! 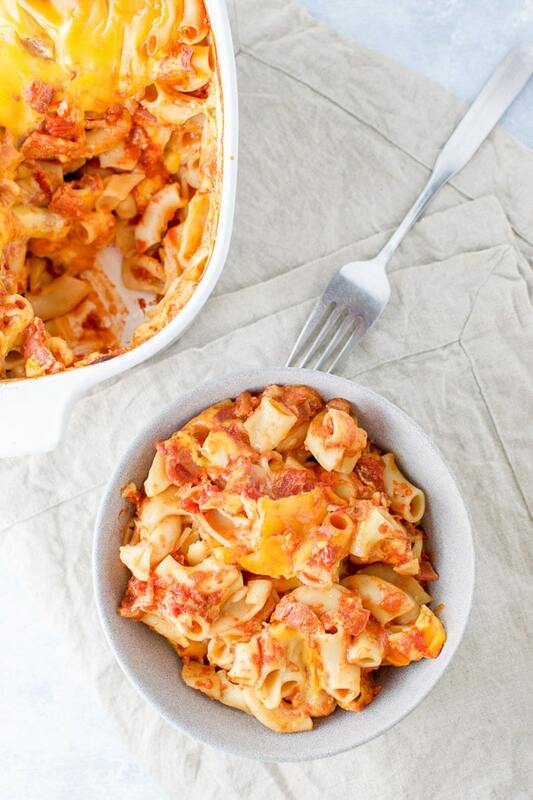 Pasta, bacon, and cheese… all things I love. And I adore that it’s a family recipe, those are the best! Pinning for later! It is a comfort food. My family and extended loves this casserole. Aw your grandmother has such a cute name! Personally I’m all for 2100 when we have robots cleaning up the dishes 😉 Great recipe idea thanks! This is something our kids and grandkids would really enjoy! WOW! Beautiful photos. Who knew that velveta cheese could look so pretty! Recipe looks tasty! Thank you Kristen. I know, Velveta a guilty preservative ridden cheese concoction that I love. Bacon is the perfect addition to this cheesy pasta. Haha, it’s interesting to think about what cooking would be like in the year 2100! 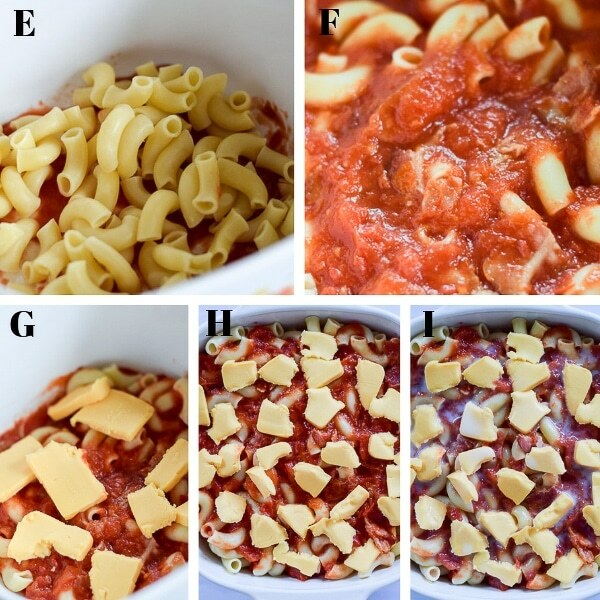 Great comfort food pasta dish! Thanks Kelly! It is one of my favorite comfort dishes to eat. What a quick and easy dinner! Looks awesome! My heart just stopped! Wow! This looks fabulous! I grew up with something similar. I can’t wait to see how this tastes! I hope you enjoyed it Joyce! So Cheesy!!! This is the perfect comfort dish! Thanks Tisha! Indeed it is! Thanks so much Sue! And yes, my family could eat it 3 meals a day! Such a hearty and comforting pasta dish. My family will love this. Thanks Andrea! I’ve never met anyone who doesn’t like this casserole! This is a real winter warmer dish, so easy to make and ideal for a mid-week supper. Pasta dishes are so good, and this is a great take on a classic recipe. Thanks Sonia! I hope you enjoy it when you try it. It truly is a family favorite. This is the perfect comfort food. We are pasta lovers in our house. This is perfect any night of the week. I would make a huge batch so that we could have leftovers in the week too. AND…bacon makes everything better!! Indeed it does Gloria! Thank you. True to your name, this dish looks delish! 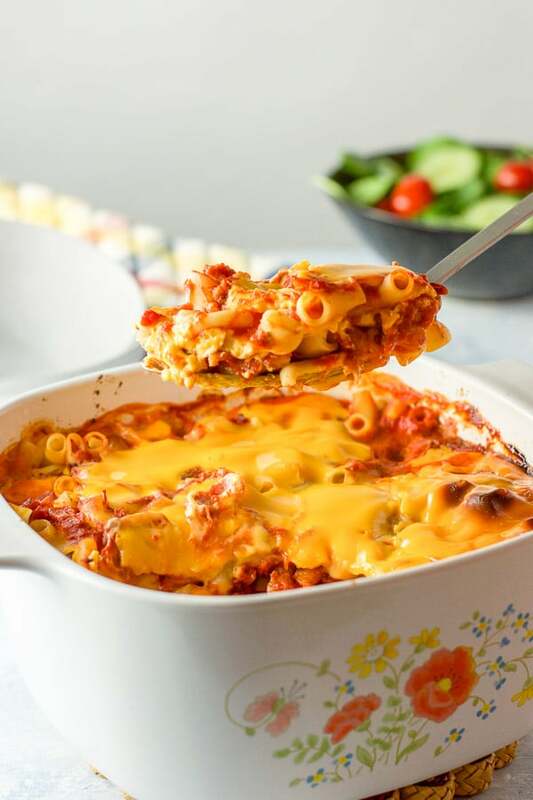 Comfort food at its best, I can’t wait to make this for my family! What a fantastic recipe with family history attached to it! Your step-by-step photos are so helpful! 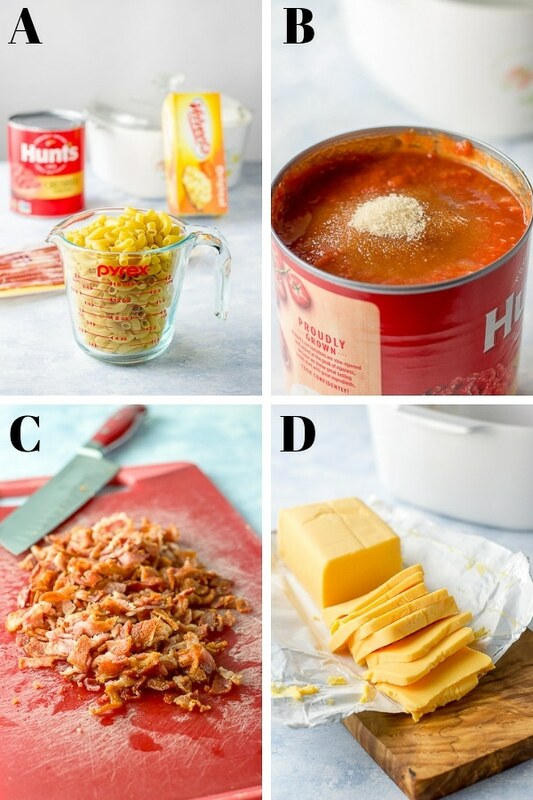 My other half loves anything with bacon and cheese, so this will definitely be making into our menu! And I’m with you on the crispy bits- I LOVE THEM ALL! Hehe. Thanks, Anna! We’re kindred spirits! I hope you enjoy it when you make it. It’s creamier and cheesier than it looks! Hehe. Thanks Dominque! I appreciate it. Thanks so much Kylie! I appreciate it. I love family recipe! You’re right!! The dishes that are our favorites and past down generation to generation are not always the most nutritious but they are might tasty!! And I have to chuckle — I have the same casserole dish as you! I’ve had it since I got married many years ago. I like the addition of bacon to the tomato mac and cheese. A great main dish that is delicious and satisfying. I have a list of family and friends who will just drool over this one. So crazy simple and all the right flavors! Yum! Thanks Lorie!! I hope they enjoy it! This is great comfort food that would be so perfect for an easy weeknight dinner! Thanks Kathryn. And yes, it’s so easy and perfect for weeknight dinners! 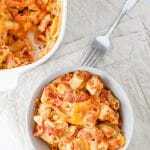 Pasta is such a great, busy weeknight option and I bet bacon really takes it to the next level! We’ll definitely have to give this a try. Thanks so much Claire! I appreciate it. I hope you enjoy this recipe once you do try it. This recipe is a keeper! Soul warming, delicious and filling. You are so lucky to have your Grandma’s recipe. Thank you Jagruti! Yes, I treasure all of her recipes! Thanks so much Jo! I appreciate it! This is truly major comfort food for me. Tasty recipe, too! Thanks Christopher! One of our family favorites!